The staff of the hostel is veeeery friendly and helpful. They helped me a lot to manage my trip. 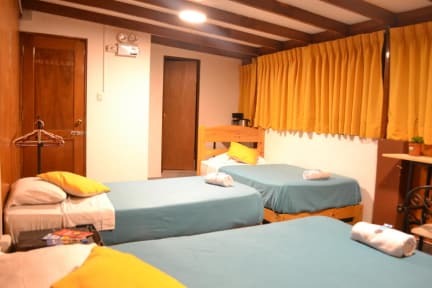 The location of the hostel is easy to reach from the airport via Lima Airport Express Bus. The hostel is cheap and clean and a great place to stay. I would recommend it to other travellers (also solo travellers!). To visit the main city center it takes you a few hours (better as a day trip). You can also borrow a bicycle at the hostel. I totally recommend this place. Really comfortable and clean rooms, and was great is that there is hot water. All the members of the staff were super friendly and helpful. I have to say the best part was the breakfast, it was delicious!! I would definitely stay there again. No outlets in the upper bed of dorms. Only one whole in one bathroon per floor. Awesome staff and environment, familiar ambient. Triple private ensuite. 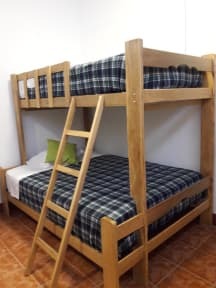 2 bunk beds. Top bunks didn't have railings so it was a little sketchy up top but chose the one next to the wall. Unfortunately there was a blackout overnight so phones, etc. didn't charge. Couldnt use the buzzer to get back in at 2am. Not sure if common on this block or area. I probably wouldn't return to this hostel. The staff were very kind and accommodating, which I appreciated. While I love Miraflores and I felt safe coming home to Casa Hualpa II, there were a few things that I was unhappy about. For starters, the shower hot water only worked at certain times, which was kind of inconvenient, and I paid for a private room where I would have preferred my own bathroom, but four rooms shared the same bathroom and there were a lot of guests. The wifi was also spotty. no possibilities to hang out: they got 3 couches in the "lobby" but it's not really comfortable to hang there. rooms (especially 6&4 dorms) are NEVER as pictured. rooms aren't very clean, sometimes ants in the room/bathroom. ground floor is loud. breakfast is weak, especially for the price you pay for rooms incl. breakfast. staff is VERY nice & helpful and the location is perfect, you can reach everything within a few mins walk / by bicycle (bikes available at the hostel which is a Plus, too).